The UK Discount Retail market is set to grow by 36.1% reaching a total value of £32.5bn by 2022 according to GlobalData, a recognized leader in providing business information and analytics. The company’s latest report: ‘UK Discount Retailing 2017-2022‘ reveals that discount retailers could gain an extra £9bn slice of the total retail market as they become a more appealing destination for consumers looking for bargains as inflation continues to squeeze their disposable income. This will be good news for Aldi, Lidl and B&M Bargains which dominate the channel, with a combined share of over 70% of the discount retail market. DIY & gardening, health & beauty and homewares will deliver the strongest category growth. 89.4% of the UK population have shopped at a discounter in the last 12 months with food & grocery (F&G), non-discretionary household goods and health & beauty (H&B) the most popular product categories with shoppers. Food & grocery is the sector with the highest market value, worth £15.7bn in 2017, and will grow to £21.8bn by 2022 – taking away another £6bn from the mainstream grocers. As perception and trust in own-label has been earned by the discounters in groceries, this is the sector which the mainstream retailers should be the most concerned about as the barriers to entry have already been overcome. 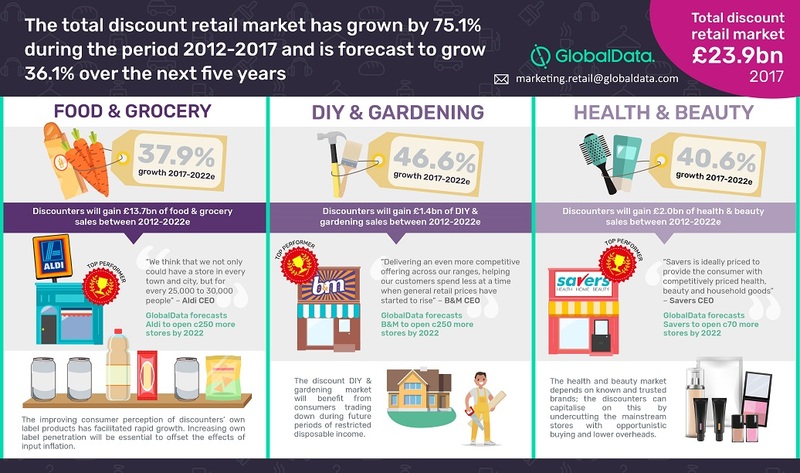 DIY & gardening and homewares are forecast to grow 46.6% and 42.6% respectively for the period 2017-2022e, as discount retailers gain market share from mainstream DIY retailers by offering consumers lower cost solutions for household maintenance and upgrades. Indeed the rollout of larger out-of-town store formats has facilitated broader ranges, providing them with more authority in the home sectors. Consumers are likely to perform fewer and smaller upgrades on their homes during the forecast period due to declining disposable income. This will benefit discount retailers homewares sales as they continue to improve their shopper appeal by increasing their range and incorporating greater trend influence – while ensuring affordability which is crucial for driving impulse and gifting purchases.